Computed Tomography is a powerful Non-destructive testing technique, that overcomes the limitations of Fluoroscopy / Radiography by producing the mass density distribution within a cross-section. However, complex objects of interest in Industrial Inspection may be difficult to understand when only cross-sectional images are available. Complex geometries & multi-layered configurations with variable density features need to be brought out in a format which could be easily understood and interpreted without much prior thinking or experience. Present study aims at overcoming these problems using 3-D visualization techniques which can enable the Inspection engineers to make mental models of 3-D aspects in the data and perceive the features in totality. CT Images reconstructed for multiple slices using a first generation CT system have been obtained and found to enhance the perception of the specimen and its features. The study highlights the tremendous potential of 3-D Visualizations in Inspection of industrial components. Besides leading to improved inspection, 3-D Visualizations can help in better decision making and modifications in design of critical components. Computed Tomography (CT) which provides cross-sectional view of the interior of an object has revolutionized the medical diagnostic field and is now expanding fast in non-destructive testing evaluation of industrial components. However, complex objects of interest in Industrial Inspection may be difficult to understand when only cross-sectional images are available. Tomographic Visualization in 3-D can serve as a powerful aid for decision making and evaluation of critical components and assemblies. With the availability of high speed computing platforms, the 3-D graphics visualizations have been made possible. The graphical visualizations can enable the Inspection engineer to make mental models of 3-D aspects in the data and perceive the features in totality. Complex geometries & multi-layered configurations with variable density features could be brought out in a format which could be easily understood and interpreted without much prior thinking or experience. Besides leading to improved inspection, such 3-D Visualizations can help in better decision making and modifications in design of critical components. 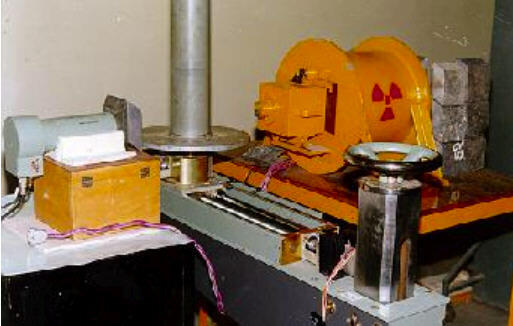 Defence Laboratory, Jodhpur has developed a first generation CT system based on Cs-137 / Ir-192 radio-isotope source , the performance of which has been evaluated and found comparable to any such system available elsewhere. The dataset obtained by the data acquisition system comprising of a NaI(Tl) detector and associated electronics is used to reconstruct cross-sectional CT images of the specimens for the chosen slice. Fig.1 shows the CT system used. CT images for multiple slices have been used for 3-D Visualizations of the specimen. Present paper highlights the graphic visualization potential which can be of immense use in Inspection & Re-engineering of industrial components. The Visualization has been carried out after suitably adapting a powerful PC based Medical Imaging System - ANAMICA developed using VC++ in WinNT environment by ANURAG (Advanced Numerical Analysis & Research Wing, Ministry of Defence, Hyderabad, India). Visualization used objects e.g. for isovalue surface generation grid is required. Grid was generated for a 3-D object with a spatially contiguous image dataset specified over a volume of interest i.e. multiple slices of the specimen. The pixels of the image which make up the grid are called voxel elements. All 3-D Visualizations use grid as the input. Surface which is characterized by a set of 3-D points, a set of polygons and lists of points constituting these polygons, were used to represent boundaries of particular objects by proper selection of isovalues. Templates created for getting a surface representation were used in visualizing object and selections for desired locations. Isovalue surface generation for a grid with a user specified isovalue was possible. (a) Sample 1: a cylindrical steel specimen with three circular cavities. (b) Sample 2: a rectangular steel specimen with multiple holes and a notch. The 3-D grid for all the samples were generated using data for 20 slices only. Fig.2 shows the Isovalue surfaces generated for sample 1 & 2. The surfaces clearly show the defects in the specimen and air envelope surrounding the object. Fig.3 shows the extraction of a particular planar section out of the sample 2 at defined cutting plane orientation thus enabling information of features along the defined plane. The three holes present through-out the depth are clearly seen in the extracted zone. Fig. 4 shows the curved section extracted out from sample 1 for user defined curved profile. The density variations along the curved profile can be viewed w.r.t. the 3-D cover box with the facilities of rotation of the section. The inner cavities are clearly visualized along the depth of the selected curved profile. This feature establishes the utility of visualization in complex mechanical components in their true perspective. Fig. 5 & Fig. 6 show the volume rendered isovalue and sectioned images for sample 1 & 3 respectively for different orientations which clearly bring out the features present in these planes, thereby facilitating perception in totality. The holes in sample 1 and cooling channels in sample 3 are clearly seen at the selected section in the 3-D specimen. The 3-D views at region of interest with options of variable pseudo coloring patterns for the three orthogonal axes, present the complete picture of that zone in an easily understandable format. All quantitative data could be obtained for analyses. The extremely powerful 3-D Visualization techniques have been used for highlighting specific features at specific locations in Computed Tomographic Images. Techniques enable the Inspection engineers to make mental models of 3-D aspects in the data and perceive the features in totality. The capabilities definitely enhance the perception and can serve in decision making for critical components as well as reengineering. 3-D grid data can also be used to generate finite element models of the manufactured industrial components which can be used for finite element analysis and deviation studies w.r.t. the actual design. This 3-D grid can serve as an interface to CT & FEM. The authors are grateful to Dr RamGopal, Director, Defence Laboratory, Jodhpur for his encouragement in carrying out this work. The constant help and guidance of Dr G Athithan, Sc'F and his colleagues at ANURAG, Hyderabad is greatly acknowledged. The work has been carried out under Defence Research & Development Organisation, Ministry of Defence, India. G T Herman," Image Reconstruction from Projections : The fundamentals of computerized tomography", Academic Press, New York, 1980. D F Rogers & J A Adams,"Elements for Computer graphics", McGraw-Hill, 1990. P K Khatri, G L Baheti, Nisheet Saxena et al,"Performance evaluation of Gamma ray tomographic imaging system", Trends in NDE science & Technology, Oxford IBH publication,3,pp1435-1438, 1996. Bushberg T J et al," Essential Physics of Medical Imaging", Williams & Wilkins, Maryland, USA, 1994. N Saxena, P K Khatri, G L Baheti et al, "Adapting a fluoroscopic system for tomographic visualization", Insight- Journal of British Institute of NDT,Vol 40,NO.8, pp 570-572, 1998. Peter Finnigan, Alan Hathaway & William Lorensen, "Merging CAT & FEM", Mechanical Engineering, pp32-38, July1990.